Only 87% of the premiums you pay to the insurance company goes to pay for healthcare costs. The rest goes to pay for the company’s administrative costs and profit. (source) And the truth is, much less than 87% pays for your health care because the money is not paid out evenly for each policy. The guy having brain surgery is using much more than his share than you are. If you think about it you will realize it is true: You could not possibly get your money’s worth out of your insurance company or they could never stay in business. They have to make sure they pay out less money then you pay in one of three ways: raising your premiums and fees, denying certain procedures, paying doctors and hospitals less. That’s why your insurance probably only lets you go to certain doctors: they’ve cut a deal with these doctors to pay them less for their services. What they don’t tell you is that you end up paying more than the amount they save paying the doctor. The dirty secret is that if you saved up all the money you pay the insurance company in a savings account and paid for your health care from it, you would save a lot of money over your life. As messed up as Health Insurance seems, it has nothing on government health care programs. Medicare has all of the problems of private Health Insurance companies, compounded exponentially by the unfortunate fact that they are the government and feel they are above the laws and rules of normal businesses. The government automatically seizes your “premiums” for medicare, whether you plan on using it or not. They then take your money and spend it on whatever they want: paying bloated government salaries, pet environmental and social programs, etc. To court the vote of minorities, they give healthcare to people who pay little or nothing into the pot. The situation is so bad, the government would never dream of releasing where all the money goes like insurance companies are required to do. 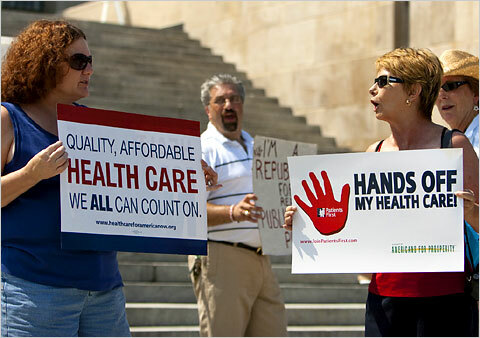 By 2012 it is estimated that medicare will eat up one in five tax dollars. By 2030, Medicare will claim one in three dollars and by 2050, that number rises to one in every two tax dollars. Obviously, our government’s health care spending spree cannot last forever; we cannot afford to spend half of our tax dollars on people’s medical bills! The government has notoriously already begun the necessary steps to keep the scheme going: raising taxes, denying/rationing more and more procedures, slashing reimbursements to doctors and hospitals (to the point where many are going out of business) and borrowing massive amounts of money from China. At least private insurance companies have to follow the laws: the government can confiscate your money and offers no guarantee of health care benefits. That being said, the uninsured in America are causing us problems because the government provides them high quality health care with your money! Illegal immigrants and criminals in prison are given great health care even though they pay nothing of their own money towards it! And then there are our government employees themselves: Providing themselves with the finest health plans the world has ever seen while they talk of rationing care for the public.